Flat View. 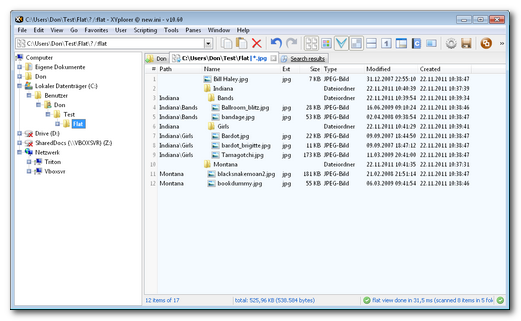 Lets you view the contents of all subfolders of a folder in one list. From version 10.70 onwards "Flat View" is called "Branch View"! 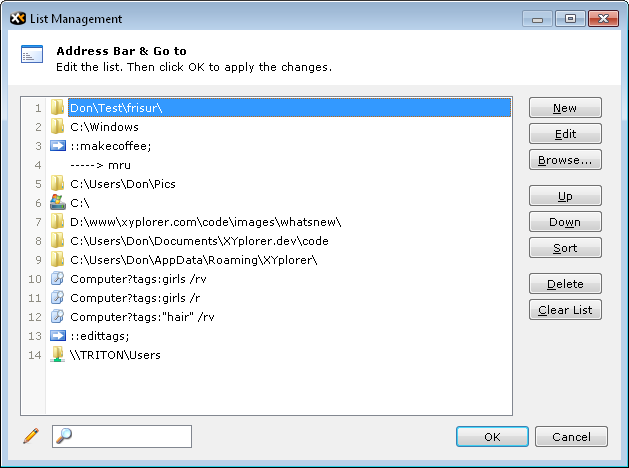 See Multi Branch View in version 10.80 for continued development of this feature. Flat View is probably one of those features you never want to miss again. 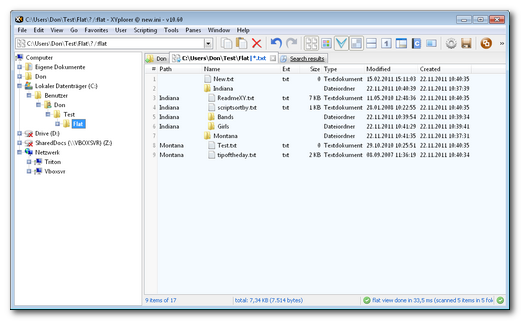 Utterly easy to handle it gives you intuitive file system views that no other interface has to offer. 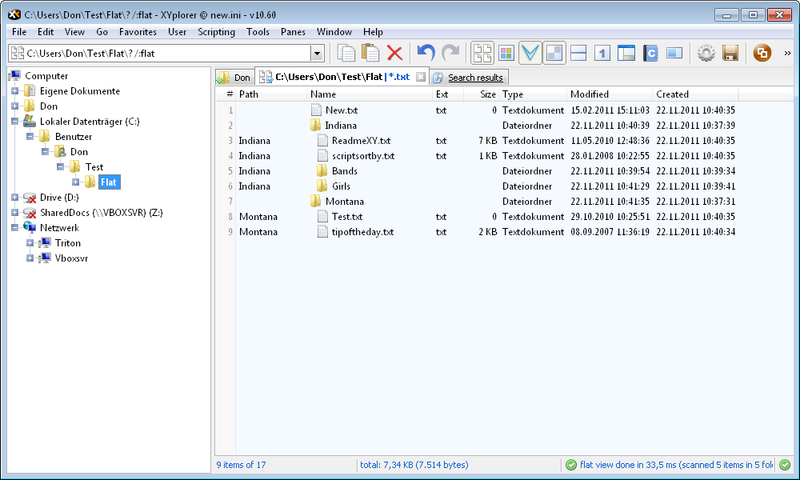 A folder in normal un-flat view: You cannot see what's inside the listed subfolders. 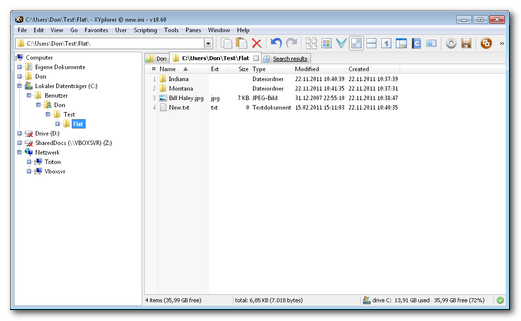 The same folder in flat view: Now you see everything inside, neatly indented and in a tree-like sort order. Like Search, FV is stored tab-wise and remembered between sessions. Unlike Search, FV is always done in the current tab (even if it is locked). A tab on FV is marked by a special icon. Refresh List will refresh FV, it will not rebrowse the folder in normal view. FV never follows folder links or junctions. You can drag-n-drop items from one folder into another within FV. FV can be combined with Visual Filters. FV can be combined with Name Searches (incl. Boolean Logic and Regular Expressions). Specific FV patterns can be stored in and triggered from Address Bar, Favorites, Catalog, User-Defined Commands, and Scripts. 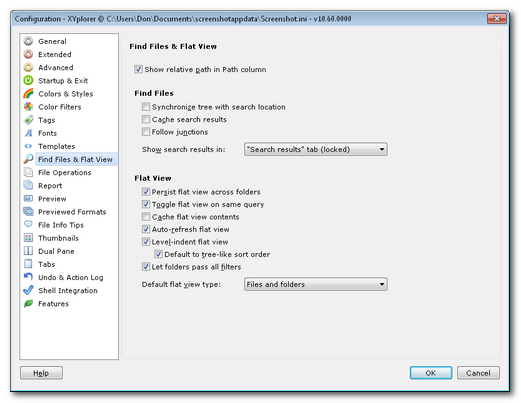 Flat View configuration options in Configuration | Find Files & Flat View. Note that most of the toggles are also available in the toolbar button's right-click menu. One particular configuration option is worth mentioning here: Let folders pass all filters. 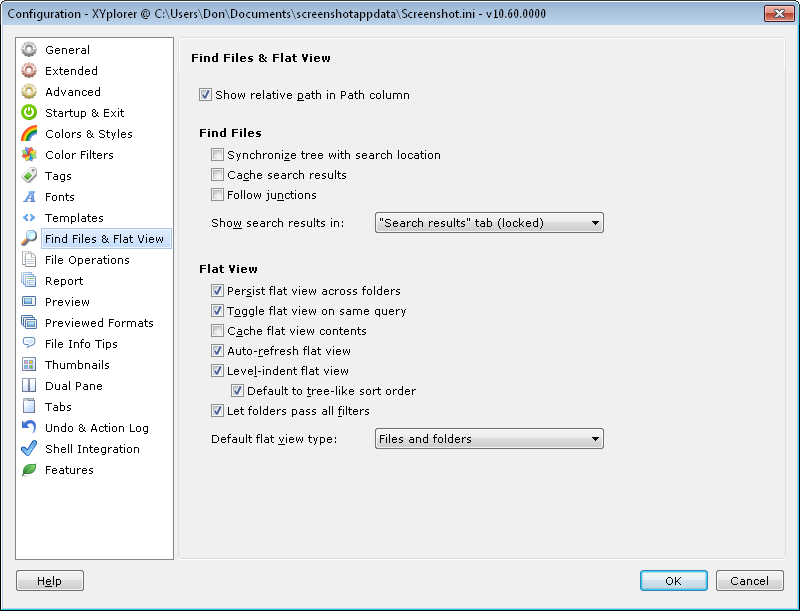 If ticked then on a mixed flat view (showing files and folders), any Visual Filters or Name Search patterns only apply to files, not to folders. So the folders always stay visible while their contents are filtered. 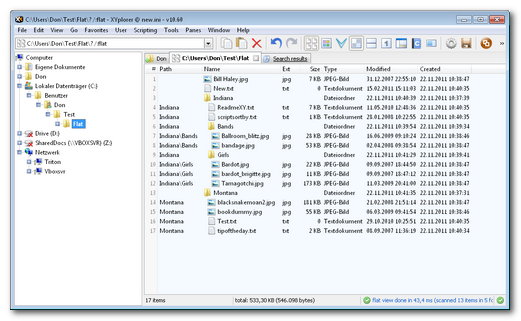 This feature, combined with level-indent and tree-like sort order, enables you to view a Filtered Branch (a branch is a subsection of the Tree) in the file list, for example a branch showing only certain image types or only TXT files (see screenshots below). 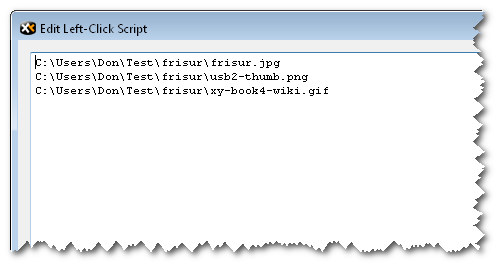 A real time-saver when perusing the file system under certain aspects. 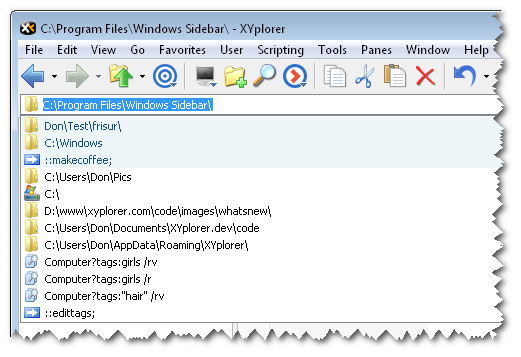 The same folder as above in flat view, filtered to show only JPG files (applying a Visual Filter *.jpg to the tab). Note how the folders themselves are not filtered out because Let folders pass all filters has been enabled. 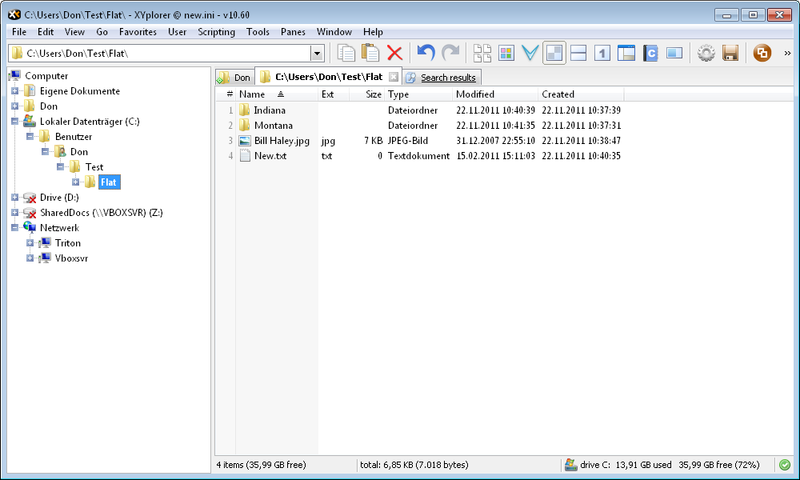 The same folder as above in flat view, filtered to show only TXT files. Sticky Section. Now items in most-recently-used lists can be made permanent by moving them into the Sticky Section. 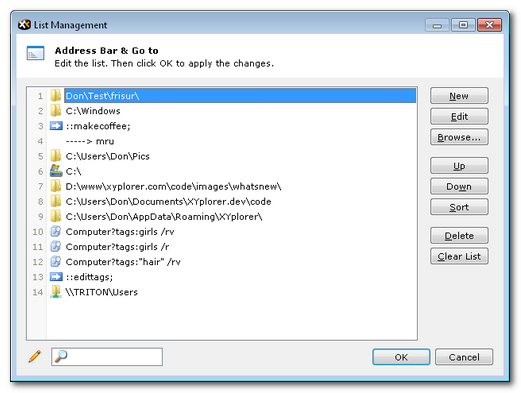 Various most-recently-used (MRU) lists can have an optional Sticky Section. Items in the Sticky Section are permanent members of this list and will never be pushed out when new items are added. You can use this section for your all-time favorite items and carefully crafted patterns. The Sticky Section can be added via List Management (menu Tools), simply add this dummy item as section separator: -----> mru. Everything above the separator is in the Sticky Section, everything below it is in the MRU Section. Configuring the MRU list of the Address Bar. The three top items are in the Sticky Section. This is how the above defined Sticky Section comes out in the Address Bar dropdown. It's shaded with a light-blue. The section separator is hidden. Step 1: Define the application and the icon for the button (right-click the button and click "Edit..." to open this dialog). 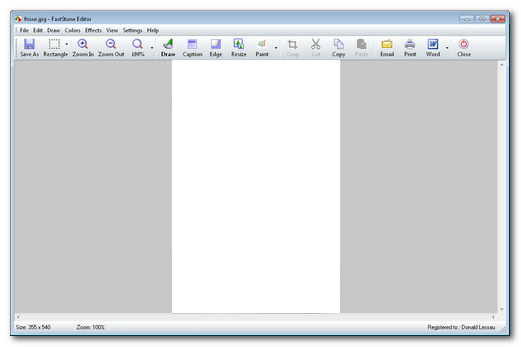 Step 2: Define the documents to be opened by the application. Optionally tick "Fire click on mousedown". Step 3: Now the button may look like this (the one on the far right). Step 4: Click the button to open the open-with dropdown. You see the files you have defined in Step 2. 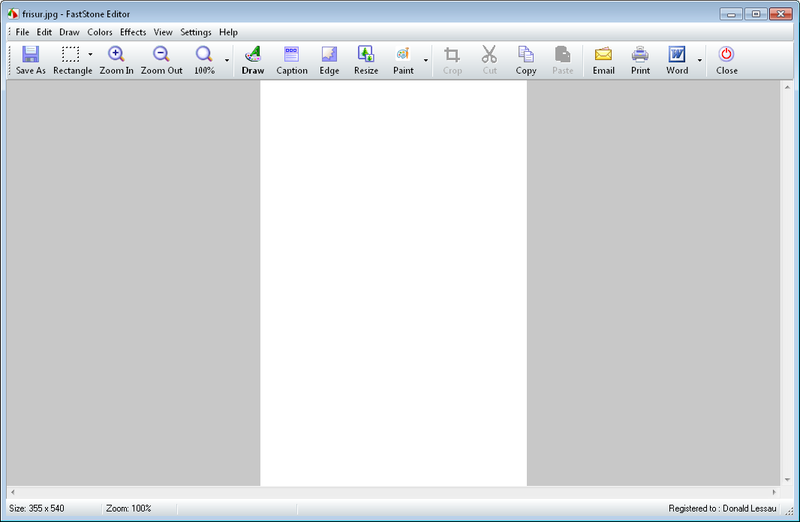 Step 5: Click the first menu item, and ta-da!, the document is opened in the defined application. Custom Copy with Verification. 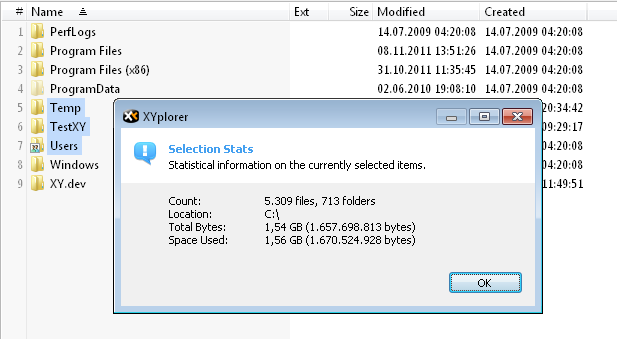 Now SHA-256 and SHA-512 hashing works on all systems (XP, Vista, and Win7). 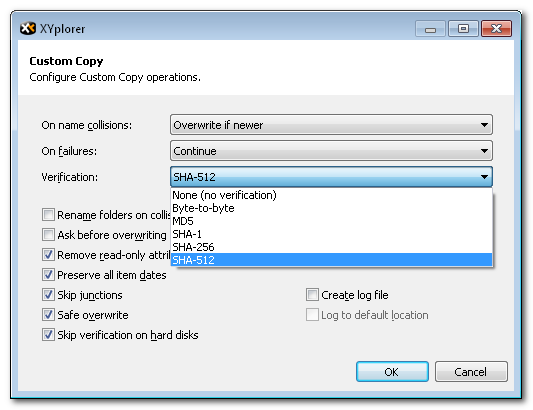 Custom Copy configuration with Verification options. Selection Stats. 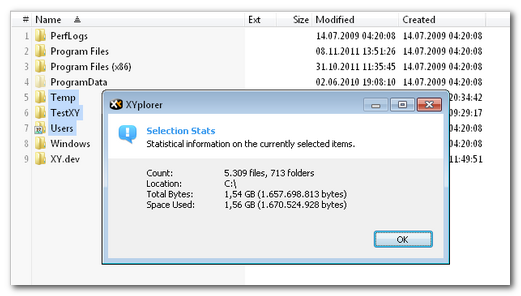 Displays statistical information on the currently selected items (recurring any folders). Get a quick picture of what you have selected there. Useful before doing a copy, or just out of curiosity. Move On Rename. Quickly move an item by entering a new path into the inline rename box. Non-existing paths are created on the fly. Quickly moving a file to C:\Stuff. If "C:\Stuff" does not exist it is created on the fly. A cute little time saver that enables you to move-and-rename files or folders in one go right from the file list. Simply enter a relative (to the current path of the file!) 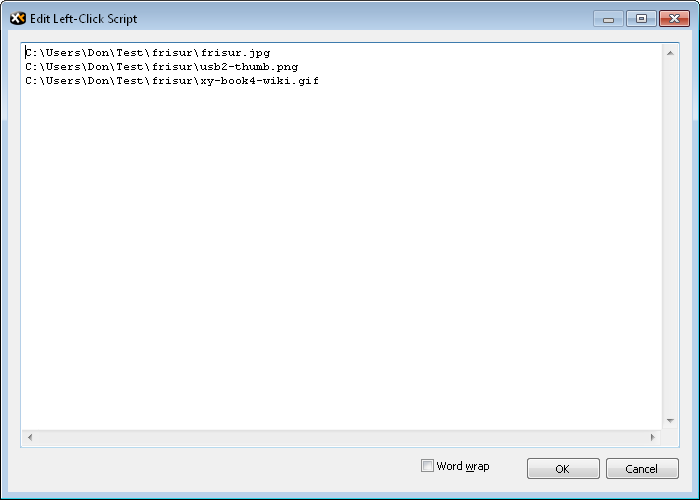 or absolute path\[name] into the inline rename box (F2) in the file list, and Move On Rename will happen. If the target folder doesn't exist yet it is created on the fly. C:\new.png        = Move file to C:\ renaming it to new.png. ..\new.png        = Move file one up renaming it to new.png. it to new.png. If "stuff" does not exist it is created. C:\stuff\         = Move file to C:\stuff\. stuff\            = Move file one down to subfolder "stuff". ..\               = Move file one up. Or create a new folder and paste Parent\Child into the fresh rename box: The relative path "Parent\Child" is created in the current path.